BSJ | Ocean Circulation – a climate changer? Ocean Circulation – a climate changer? Will climate change ever be understood? A major limitation of current climate models is the reconstruction of ocean circulation. There is a good knowledge of modern circulation, but research is currently underway to explore whether major shifts in the past circulations coincide with significant climatic events. It is believed that on geological timescales, key climatic controls relate primarily to tectonics and ocean circulation changes. Both of these mechanisms influence atmospheric CO2 concentrations and therefore global temperatures. Ocean circulation changes can occur due to reconfiguration of oceanic gateways. A predominant example of this is the opening of the Drake Passage, the gap created between South America and Antarctica. It is thought that the opening of this passageway and the resultant interaction between Pacific and South Atlantic waters had a significant impact upon global heat transport. This ultimately led to the large scale glaciation of Antarctica. However, the limited resolution of data sets prevents accurate dating of such events and effective interpretation of feedbacks and forcing mechanisms. Salinity and carbon isotopes have been used to reconstruct modern oceanic circulation, but these are limited when looking into timescales of millions of years. Therefore, to trace circulations in geologic time, we need a more long term tracer. Neodymium isotopes could be that tracer. Shifts in the composition of radiogenic neodymium, element number 60, in oceanic records suggest an alteration of ocean circulation dynamics. Research has dated the opening of the Drake Passage to around 37 million years ago by using neodymium. 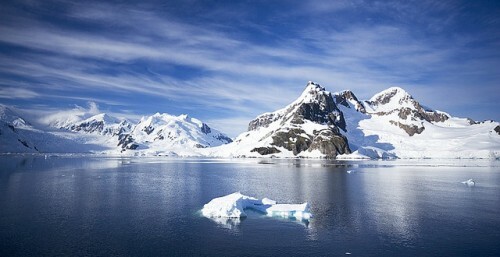 This approximately coincides with the date of the formation of Antarctic ice-sheets 34 million years ago. Each land mass has its own signature composition of neodymium isotopes, depending on the age of the continental crust. For example, the Canadian Shield, the continental material of Canada, is very old and thus has a non-radiogenic signal. On the other hand, the younger Pacific Islands show a very radiogenic signal. This signal is transmitted to the oceans through continental weathering. Shifts in the radiogenic composition of neodymium in the ocean hence relate to the origin of local seawater, and changes in oceanic circulation. This is evident in the Drake Passage where, before 37 million years ago, the South Atlantic had a very low radiogenic signal but, after 37 million years ago, the signal increased, suggesting that there was input in Neodymium from the Pacific Ocean. Although other elements such as iron and osmium can be used to trace past oceans, neodymium is arguably the best. Professor Burton of the University of Durham states that “it is easy to measure and there are a number of materials that preserve the seawater signal” making neodymium useful worldwide. Additionally, unlike carbon, a useful tracer element for recent geological history, neodymium is not affected by biological processes that take place in the oceans. However, Burton goes on to argue that “variations are not just down to ocean circulations, but also local changes in erosional input.” Therefore, much more research and data needs to be obtained to constrain the input of Neodymium for accurate geologic time measurements. Exploring the relationship between ocean circulation changes and climate is critical for both climatic reconstruction and prediction. There have been concerns about the shutdown of the Gulf Stream, the ocean current which supplies the UK with warm water from the west coast of America, as this would have huge climatic impacts for Western Europe. Primary concerns for this shutdown would be a dramatic cooling in the UK as well as a potential increase in tropical storms on the East coast of North America. Discoveries surrounding past oceanic changes and their interactions are of great value for the prediction and prevention of future climate system dynamics. Neodymium isotopes pose a very powerful tool in such investigation. The future for this oceanic tracer is truly exciting, with much hope resting on interpreting more major changes in the past land distributions with relation to climatic change.